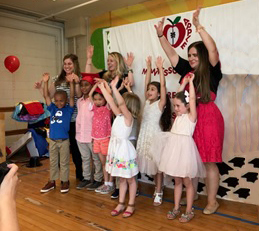 Apple Montessori Schools of Hoboken celebrated their annual Kindergarten Graduation ceremony June 22, recognizing each outstanding kindergartner for their accomplishments during their time at Apple Montessori. With Apple Montessori’s mixed-age classrooms with children ages 2-6, kindergartners are the leaders of the class. Approximately 100 family members and friends attended the event to celebrate the accomplishments of the graduates. The graduation ceremony also included Disney-themed performances by the children with skits from Moana and Snow White. To demonstrate their public speaking and elocution skills that have been developed while at Apple Montessori, each child is given a speaking part in the performances. The children worked collaboratively to perfect their performances, highlighting the interpersonal and teamwork skills honed at Apple Montessori Schools. Each child’s role in the play spotlights the confidence and independence that is fostered at Apple Montessori. Additionally, the reading, writing and cognitive skills that Apple Montessori helps develop at an early age were evident on stage as the children performed. Apple Montessori is proud of the graduated kindergartners who embody the school’s mission statement. Apple Montessori’s kindergarten program is a great way to inspire discovery and development in your child. They prepare students for school success for life by modeling their preschool/kindergarten Approach to Learning Program after their elementary school program which consists of advanced core curriculum, enrichment and beyond. Apple Montessori’s kindergarten classroom is adapted to the development needs of each child, giving them a variety of choices that engage their natural curiosity and intellect. Apple Montessori’s core kindergarten curriculum includes lessons in: practical life, sensorial, science, history and geography, math, language, and technology. Their enrichment programs include: art, music and drama, foreign language, character and ethics development, and physical education. Kindergarten is one of the most crucial developmental parts of a child’s life. Be sure to make the most of it by enrolling your child in Apple Montessori Schools. This story was originally published at The Digest Online.